Colts defenders swarm for a sack of Titans quarterback Marcus Mariota. INDIANAPOLIS — The Indianapolis Colts made a firm commitment to Matt Eberflus in January. They stuck to it after the man who initially hired Eberflus to be Indy’s defensive coordinator, Josh McDaniels, reneged on a deal to become the next coach, and they lived up to their promise after eventually hiring Frank Reich in February. The system looks awfully familiar to longtime Colts fans. Jabaal Sheard moved from outside linebacker to defensive end and already has matched his sacks total (5½) from last season. Veteran defensive lineman Margus Hunt has gone from rotation player to starter and has had a career-best season. The individual numbers tell only part of the story. 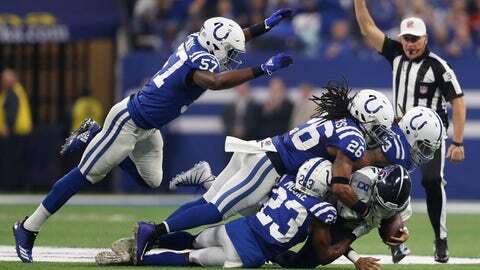 The Colts’ last four opponents have averaged only 17.5 points per game, and only four teams have more takeaways than Indy (19). But for the first time in a long time, the Indy defense no longer looks like the weak link. Instead, Eberflus has demonstrated just how promising the future could be.